I have become quite confident about the fact that I enjoy fur; and Florida Scarf enjoys fur. As I explained yesterday; it’s cold in Germany and we’re outside a lot. Fur is the perfect accessory for temperature control. This is the newest fur I have purchased for the company. I brought it to Ludwig today to see what his opinion of it was. He gave it five stars. I can now, again with confidence, say that this fur was worth it. Ludwig says the region it came from is known for it’s quality, and the way the leather was treated, on the reverse side, is quite a lot of work. The guys who I bought it from do a fine job. Ludwig says in order to have fur this soft, and clean and nice, the rabbit is raised for it. His name is King…..Rex in German. This fur is the equivalent to Kobe beef; if you’d be speaking of cows. As I write this I am surprised that fur scarves are the latest chapter in the journey of my small business. It was never a medium I had intended to work with. As I find myself in this new world however, exploring and embracing its culture and traditions, I like it. If I was in America, or at least New Jersey, I wouldn’t be afforded the same opportunities. I need to seize them. Every other place I have been I seek out traditional materials to use for my scarves and hoods. When I lived in St. Augustine, FL, I took advantage of the vintage culture. When I lived in Alabama I bought houndstooth… I also met a girl who was from Ecuador and she sold me Tagua Nut buttons. When I was recently in Bali I bought fabric; hand woven, hand dyed, and batiked. While in New Jersey lots of my buttons were handmade by my mom. Now I’m in Germany, still finding handmade clay buttons, but also finding fur. And while Ludwig hunts, rabbit and boar and deer and such. It is expensive to tan the hides. He doesn’t pay to do it anymore. This is why I have to buy it from someone else. After today however, Ludwig has begun to needle me to purchase the rest of his furs from him. He still has a few that he has not gifted to me. I’m sure I will buy them. I visited with him and Katharina today and gave them their Christmas basket….Oh and I got my feet wet in the tax office. 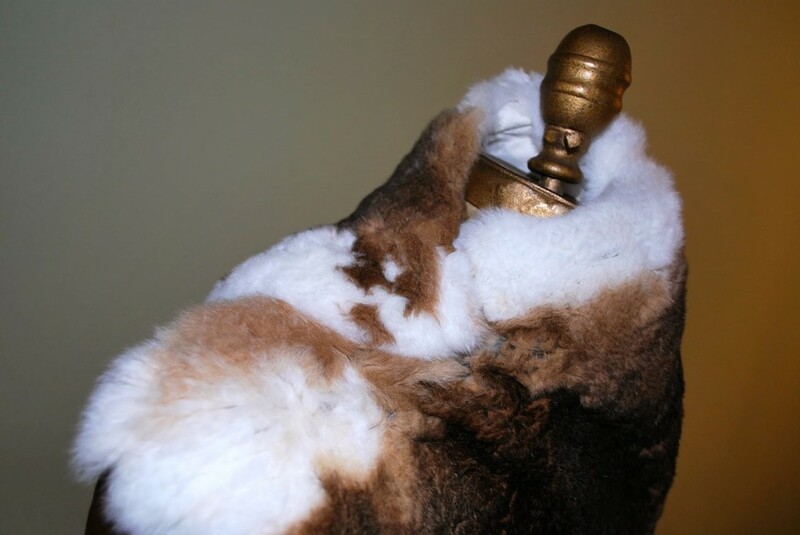 This entry was posted in Uncategorized and tagged Fur, germany, pelts, rabbit, supplies.